Learn how to make a homemade mayonnaise recipe. It is very easy to make with an electric mixer or blender. It is made by slowly adding oil to egg yolks while vigorously beating to blend the two together. It is the stable emulsion of the egg yolks, oil and either vinegar or lemon which makes the mayonnaise. The homemade mayonnaise recipe must achieve the correct balance of fat to prevent the emulsion from breaking down; not more than eighty five percent in fat. When learning how to make a homemade mayonnaise recipe, either whole eggs, just the yolks or even all whites can be used. The whole eggs make a thinner dressing; for all whites it must be done using a high speed in a food processor to blend it correctly. 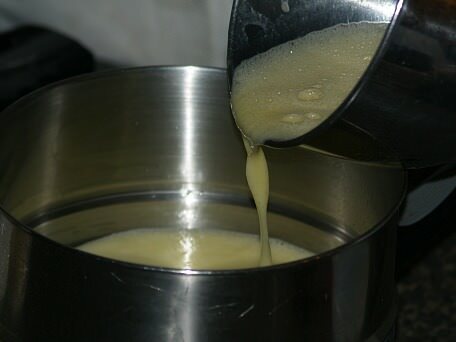 It is essential to add the oil to the eggs one drop at a time at first; otherwise the emulsion might break down. This will cause the oil to run together and float on top of the finished dressing. Mayonnaise was most probably created when the French brought a sauce recipe home from Spain. Originally, when one learned how to make a homemade mayonnaise recipe, it was made by hand with a mortar and pestle; today it is made easily with our electric appliances. Since the original recipe, many have been created using a variety of other ingredients like butter, milk, creams and many different spices. The mayonnaise recipe can be interchanged with the commercial mayonnaise. Keep in mind that commercial mayonnaise dressings are of two kinds; mayonnaise and salad dressings. The mayonnaise types are thicker and quite stiff with very light seasoning. The salad dressings are thinner and more highly seasoned. Depending on what you are using the mayonnaise for, it could have an impact on your recipe. Combine in a mixing bowl the mustard, sugar and flour. Gradually add the milk beating until smooth. Add the eggs one at a time beating after each. Add the butter; Beat in the hot vinegar last. Place pan on medium heat and cook until desired thickness, Cool and store in jar with lid in refrigerator. 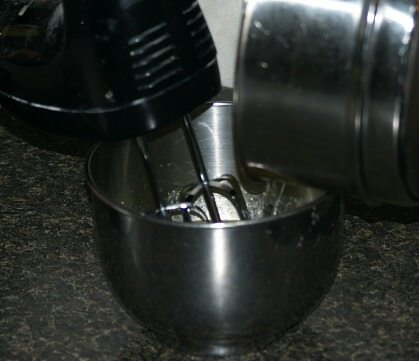 Place egg yolk in a mixer bowl. While beating gradually add the oil. Add the vinegar, garlic and salt while beating. Combine the mustard, salt and sugar in a mixing bowl. Beat in the eggs and melted butter; beat in the hot vinegar. Cook in a double boiler until thick; remove from heat and chill. 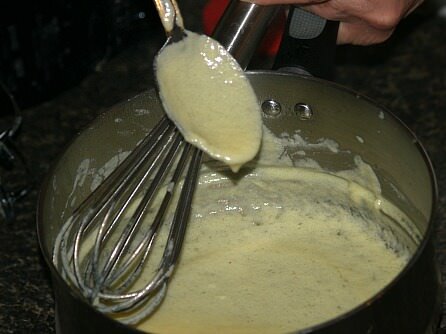 Combine the chilled egg mixture with the stiff whipped cream and fold in. 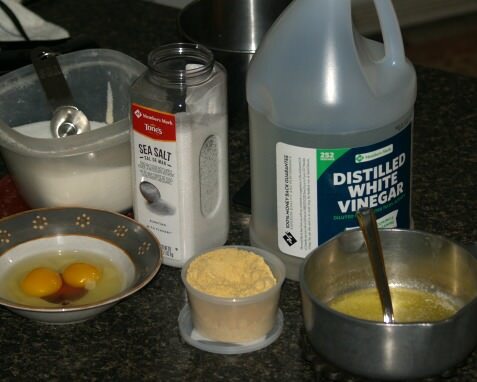 Use your homemade mayonnaise recipe to make a variety of other mayonnaise recipes and dressings. Make Russian Dressing Recipe: Blend 2/3 cup mayonnaise, ¼ cup chopped olives, 2 tablespoons chopped sweet pickle, 1/3 cup chili sauce and 1 chopped hard boiled egg. Thousand Island Dressing Recipe: Blend 2/3 cup mayonnaise, 1/3 cup chili sauce, 1 tablespoon chopped green pepper, 3 tablespoons chopped pimiento and 1 tablespoon chopped chives. French Dressing Recipe: Blend ¾ cup mayonnaise and ¼ cup French dressing. Fruit Mayonnaise: Blend 1 cup mayonnaise with 2 tablespoons honey; blend in 2 tablespoons orange juice and 2 tablespoons pineapple juice. Cucumber Mayonnaise: Blend 1/3 cup very finely diced cucumbers into 2/3 cup mayonnaise. Chive Mayonnaise: Blend 4 tablespoons chopped chives into 1 cup mayonnaise. 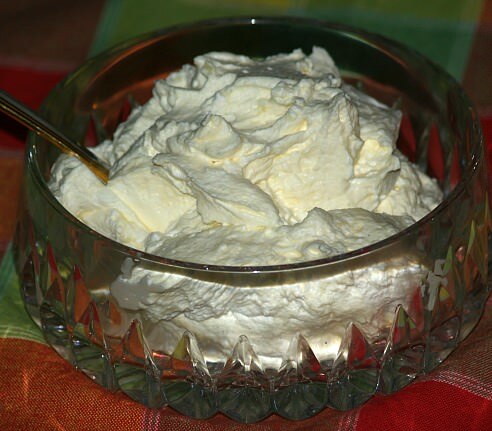 Horseradish Mayonnaise: Blend 3 tablespoons horseradish into ¾ cup mayonnaise.